The rudder controls movements of the airplane about its vertical axis. This is the motion called yaw. Like the other primary control surfaces, the rudder is a movable surface hinged to a fixed surface - in this case to the vertical stabilizer, or fin. Movement of the rudder is controlled by two rudder pedals - left and right. Its action is very much like that of the elevators, except that it moves in a different plane; the rudder deflects from side to side instead of up and down. When the rudder is deflected to one side, it protrudes into the airflow, causing a horizontal force to be exerted in the opposite direction (Fig. 4-6). This pushes the tail of the airplane in that direction and yaws the nose in the desired direction. When rudder is used for steering during ground taxiing, the propeller slipstream provides the force to yaw or turn the airplane in the desired direction. As mentioned earlier, the primary purpose of the rudder in flight is to counteract the effect of adverse yaw and to help provide directional control of the airplane. In flight the rudder does not turn the airplane; instead, the force of the horizontal component of wing lift turns the airplane when the wings are banked. As in the demonstration of turning by use of ailerons alone, this can be verified by flying straight and level and then, after taking the hands off the aileron control, trying to turn to the right by applying right rudder pressure only. At first it may seem to work pretty well. The airplane will turn to the right but it will also skid to the left. (A skid in a turn is caused by insufficient angle of bank for a given radius of turn.) Since the airplane possesses inherent stability, it will tend to stop the skid by banking itself to the right. If the pilot were to now neutralize the rudder, only a shallow banking turn would result. However, inasmuch as the purpose of this demonstration is to make a turn using only the rudder, continue to hold right rudder pressure. Since the airplane is slightly banked to the right, the rudder will force the nose of the airplane downward to the right. The reason for this is that yawing is the only movement the rudder can produce. As a result, the nose yaws downward, the airspeed increases, and the airplane starts losing altitude. At the same time, the airplane, being stable, attempts to stop the increased skidding by banking more steeply. The more steeply it banks, the more the nose is yawed downward by the right rudder action. The net result of holding rudder alone is a descending spiral unless back elevator pressure is applied. 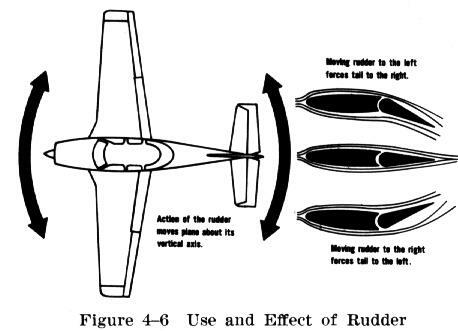 Thus, it can be seen that rudder alone cannot produce a coordinated turn. Blending aileron, rudder, and elevator pressure does that.